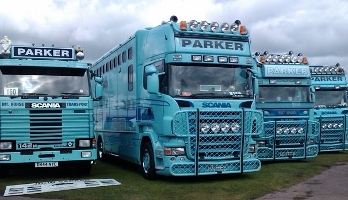 "Thank you for the way you treated my horse, he arrived fit and happy and very content"
Parkers' fleet of horseboxes are driven by very capable men and women who take care and pride in the horses they carry. The second generation of the Parker family, Fred is now on the road, continuing the tradition established by John and Jackie. John Parker International pride themselves in their caring and professional attitude. This attitude coupled with our experience and friendly nature ensures that our customers return time and time again. We have good access to the motorway being just two miles from Junction 11 of the M20. As we are ten minutes outside of Dover, the horses can have a good rest and stretch their legs before continuing their journey. For directions to Little Owl Barn please see our directions page. The yard is open to both customers of John Parker International and other transporters who wish to use the facilities. We can transport other animals as well as horses, please contact us for more information. John Parker International are proud to announce that we can now transport your horse with Eurotunnel. We are one of only three horse transporters in the United Kingdom licensed to carry horses in the Channel Tunnel, allowing us to transport horses without delay or distress during times of rough seas. Eurotunnel offers a fast thirty-five minute crossing time and three crossings per hour. We can also arrange for your trailer to cross via Eurotunnel. For all enquiries please don't hesitate to contact us on + 44(0)1303 266621 or email us by filling out our contact form. Copyright 2008 John Parker International Limited, Website design - Toby Wilkinson and Lisa Thompson. All rights reserved.